10.00 – 10.30Welcome from Professor Chris Williams (Head of Arts, Celtic Studies and Social Sciences, UCC); Dr Martin Howard (Head of Languages, Literatures and Cultures) Dr Daragh O’Connell (Director of CASiLaC-Centre for Advanced Studies in Languages and Cultures) and the conference organisers, Dr Chiara Giuliani and Dr Kate Hodgson. 1. Objects of loss and absence(chair Kevin Cawley) Room 302, Brookfield. 3.Material culture in the60s and 70s: music, art and literature (chair Till Weingärtner) Room 304, Brookfield. 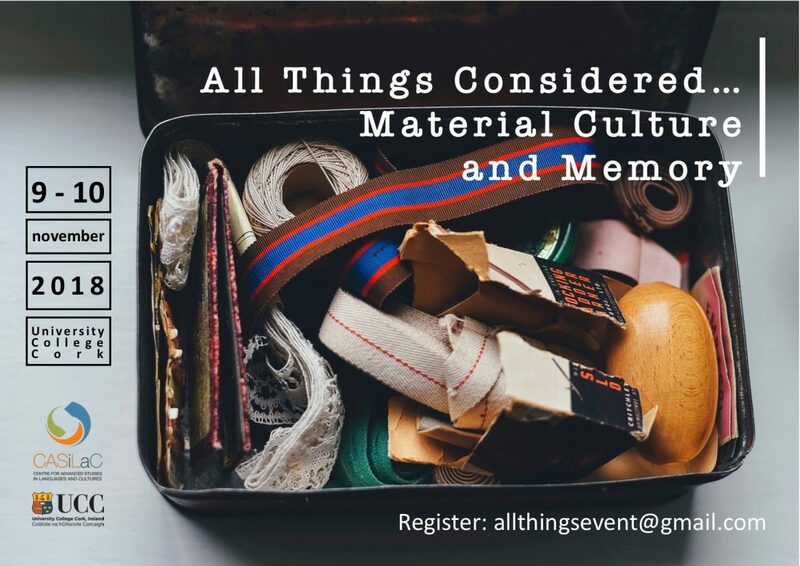 Followed by a roundtable discussion with Nuala Finnegan, Clíona O’Carroll, Crónán Ó Doibhlin (UCC) and Daniel Breen (Cork City Museum) on curating, objects and memory. 20.15 Conference dinner at Luigi Malones, Cork. Mark Chu (UCC), A Micron’s Tolerance: the quest for the Grail of perfection? 16.00 – 17.00 The Cultural Relevance of Parnell’s Walking Stick: poetry reading by Ailbhe Ní Ghearbhuigh, introduced by Daragh O’Connell. Coffee and concluding remarks. G06, Brookfield.